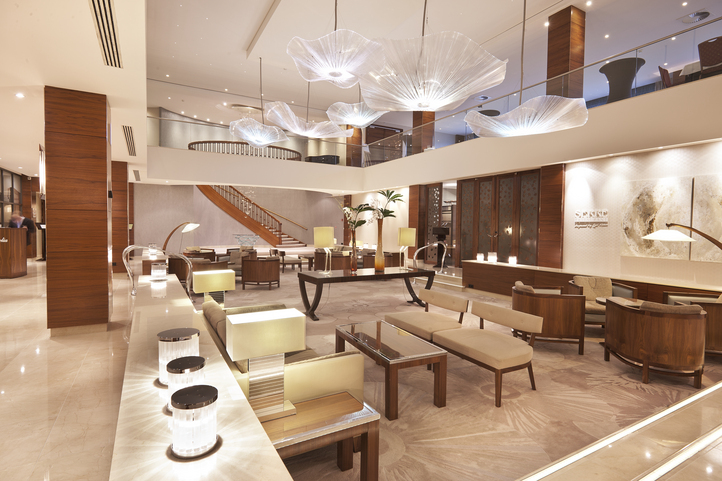 The Okura Hotel brand started as a dream. In the 1950’s, Japanese entrepreneur Baron Kishichiro Okura aspired to have the ideal hotel for people who are visiting Japan. The Okura Hotel line then started, and one can say that they were one of the forerunners of combining Eastern and Western influences in hospitality. Co-founder of Okura, Iwajiro Noda had great plans and ambitions to expand Okura to the international scene. He grew up in Holland Village in Nagasaki. (An interesting note, trade relations between Japan and Holland dates back to 1639, when the Dutch were the only foreigners permitted to trade with Japan). And so it was a no-brainer to have the first European expansion of Okura Hotels in Amsterdam. The Okura group deliberately chose the location for Hotel Okura Amsterdam. It is just outside the city centre, a 15-minute drive to and from Schipol Amsterdam Airport. One may be puzzled as to why the location of a hotel as huge as Okura would be in a slightly residential area and outside of the city centre. While deciding where to place the first European Okura hotel in Amsterdam, the Okura Group got a hold of the city/ town plan. There were plans to build an opera house in the same area, so Okura immediately secured the location and they planned to have a tunnel connect the hotel and the opera house. However, things did not go according to plan. There was much debate about the construction of the opera house, and in the end, the opera house was never built, but by then, Okura Amsterdam was well underway to its completion. 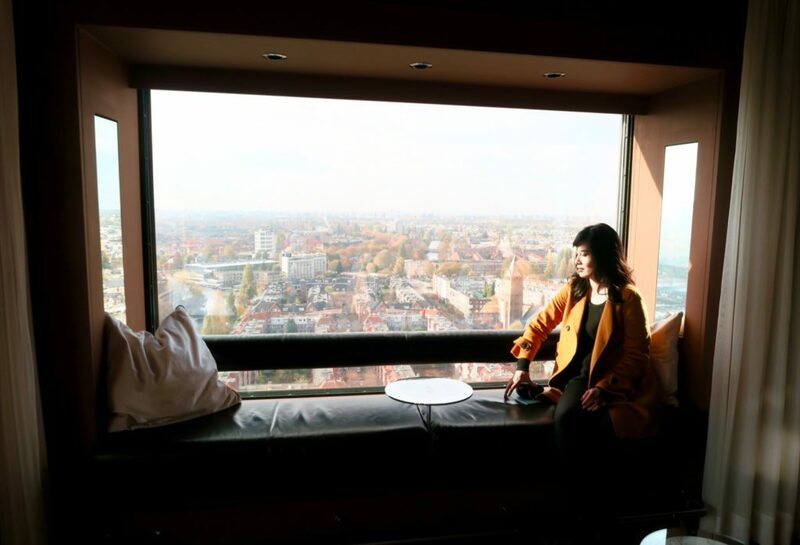 Instead of wondering, “How now, brown cow?”, when things did not go according to the grand plan, Okura Hotel Amsterdam decided to turn things around and maximise their ample space and towering height. At the present, the Hotel Okura Amsterdam is in the list of tallest buildings in Amsterdam. It helped that Hotel Okura Amsterdam’s surroundings are all lower than the building, so the hotel really stands out. Hotel Okura Amsterdam also is residence to five restaurants, one of which is Two-Michelin star rated, and two others earning a One-Michelin star rating. 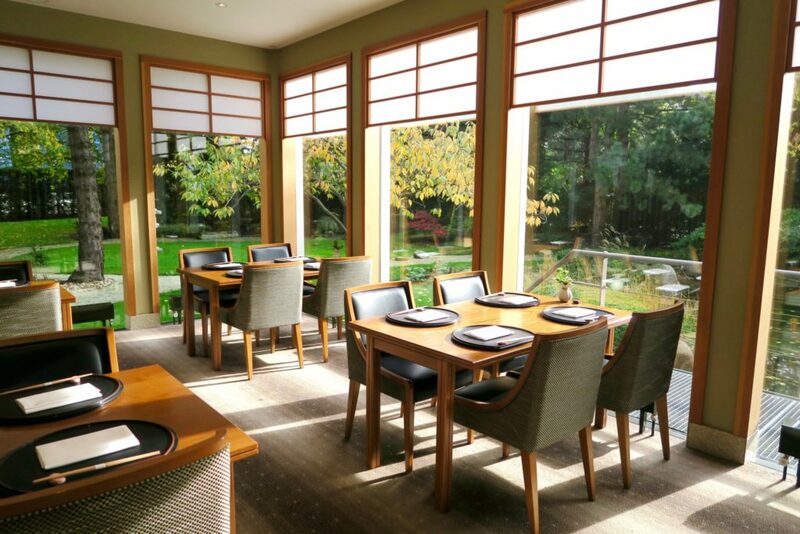 Yamazato Restaurant, (One Michelin star), is located on the ground floor of Hotel Okura Amsterdam and has such pristine, zen garden surroundings that will make you feel as if you’re dining somewhere in idyllic Japan, instead of the middle of Amsterdam. They specialise in Kaiseki cuisine, a traditional multi-course Japanese meal. 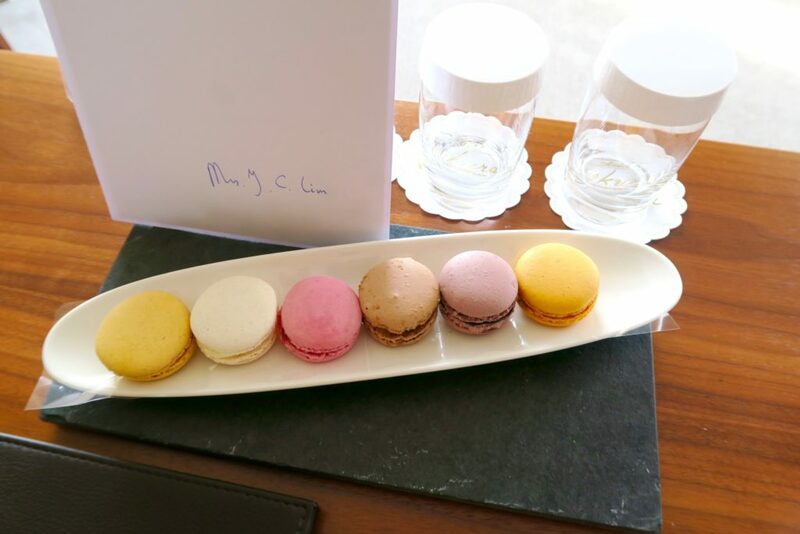 Ciel Bleu Restaurant, (Two Michelin star), has an award-winning wine list along with its international cuisine. 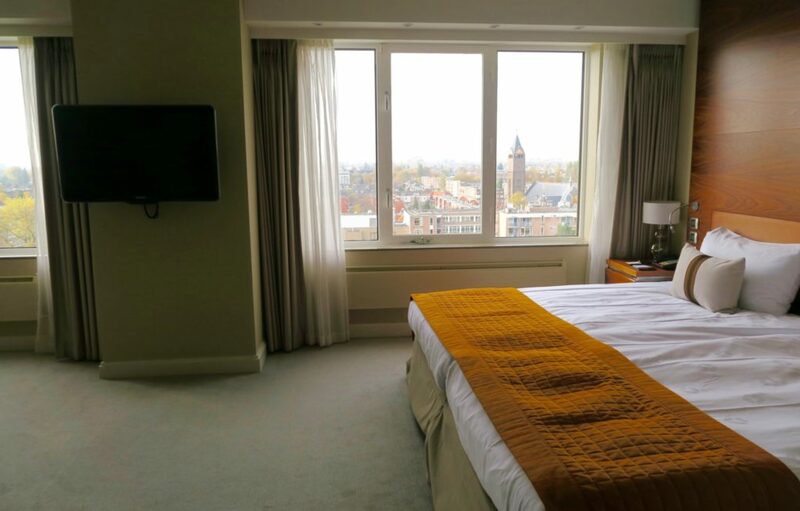 Located on the 23rd floor, guests can also enjoy a sweeping view of Amsterdam as they dine. 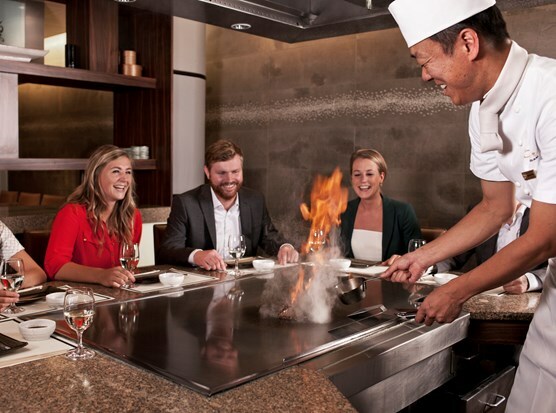 Sazanka Teppanyaki Restaurant, (One Michelin star), is the only teppanyaki restaurant in Europe to be awarded a Michelin star. The two other restaurants that Okura Amsterdam has are Le Camelia, their restaurant specifically for breakfast, with live cooking stations serving both Eastern and Western cuisine. And Serre Restaurant, a contemporary, all-day dining restaurant from 10AM-10PM that offers international specialties. 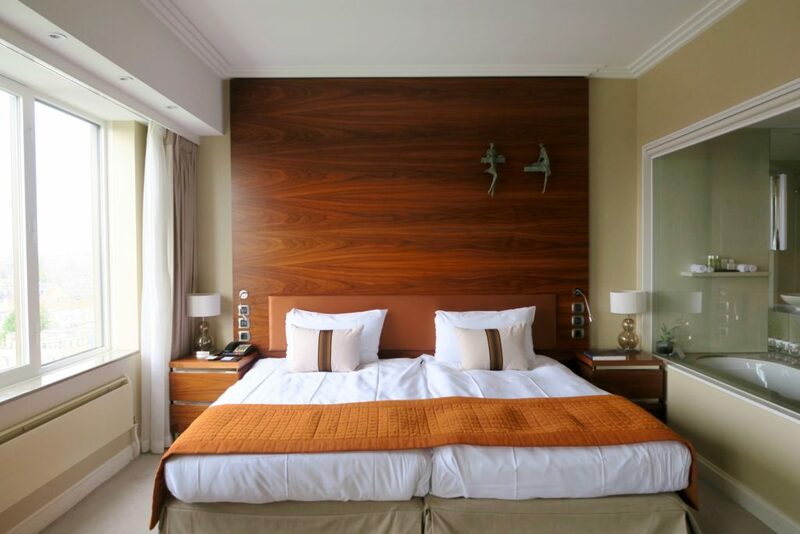 I was checked in to a Superior Room, the lead-in room category at Hotel Okura Amsterdam. At 32 square metres, the room is quite spacious and features the popular glass partition between the room and the bathroom. The room also had an ample supply of power plugs, which is really a must in all hotels now, in my opinion. I enjoyed my stay in this room, the see-through bath to main room glass partition did help in creating that spacious feeling. The only drawback that I can think of were the toiletries from the French perfumery company Fragonard. The consistency and texture of its lotions and shower gels felt really luxurious and rich. However, the scent (Verveine), was too overpowering and flowery for me. This is a matter of personal taste, and I’m sure someone finds this scent wonderful. 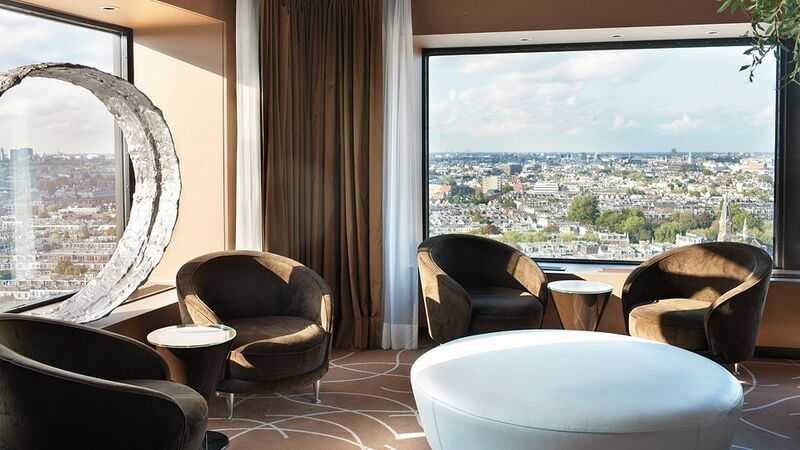 If you are staying at the Okura Amsterdam, consider booking an Executive Room. 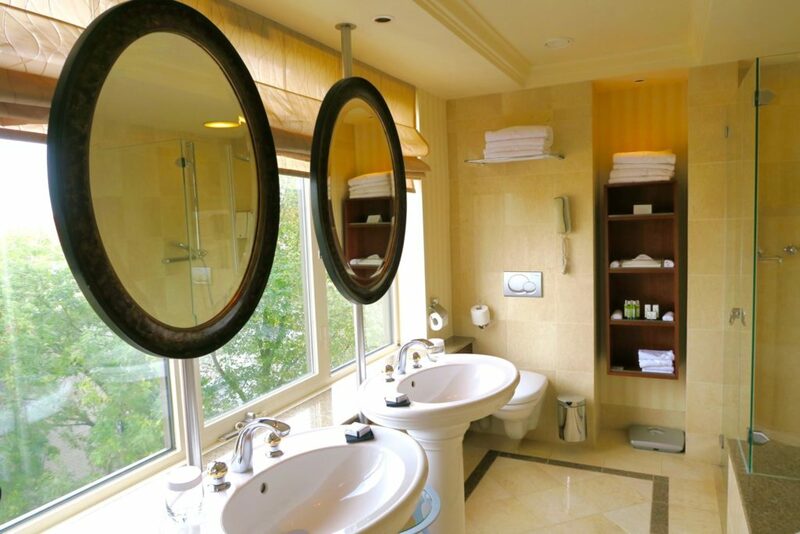 Their bathrooms feature a double sink with double oval mirrors facing the windows. 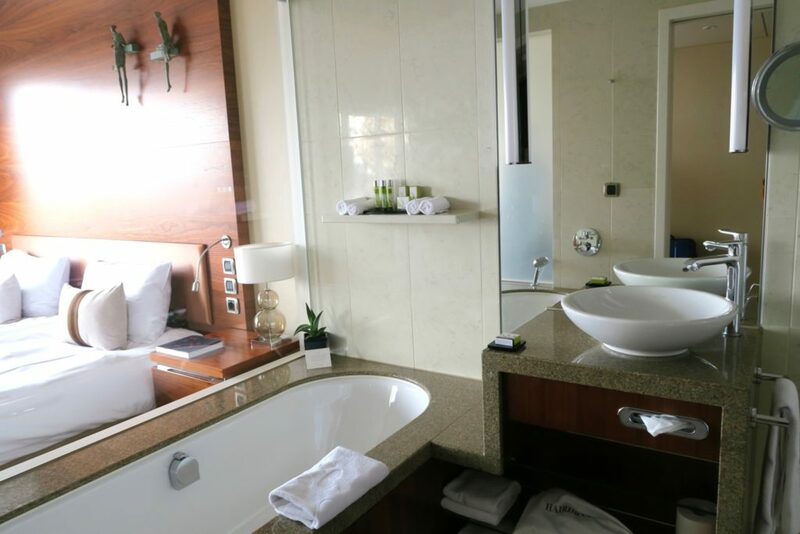 I was only able to see a 6th level Executive Room as most of the rooms were booked out, but Executive Room bathrooms located 10th floor and above really have breathtaking views. Given the number of restaurants (and Michelin star -rated ones at that) inside Okura Amsterdam, it is not surprising that the hotel takes food seriously. They have a proper cooking studio in the hotel for cooking classes. And by “proper” I mean that there is one station dedicated to the chef or cooking instructor, with cameras pointed at the working space in different angles. Students are then shown a live feed of the demonstration , again in different angles, in order to properly see the procedures. 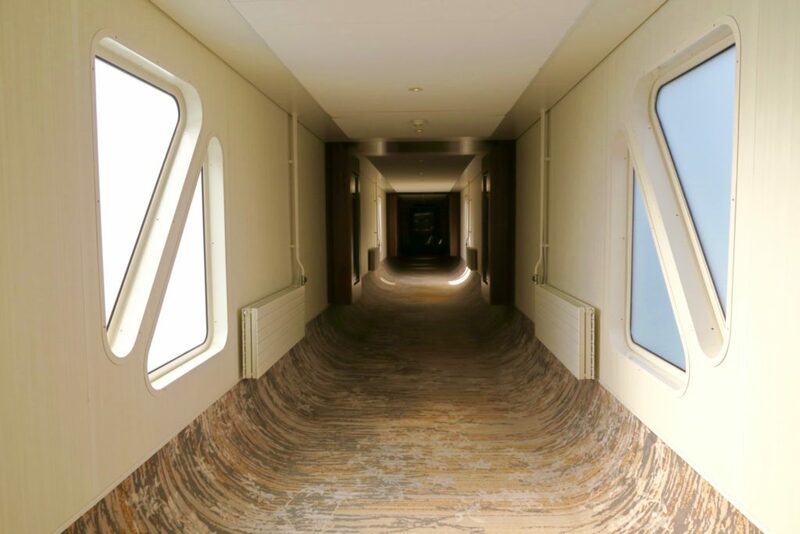 One of the most random, peculiar and most interesting thing I saw at Hotel Okura Amsterdam, was the installment of an actual airport jet bridge (from the 70’s or 80’s no less!) to use as an connection from one part of the building to the other. I was told that this was specifically purchased from Schipol Airport to incorporate in the hotel design. Though the connection (to the theme or history of the hotel?) remains unclear, it makes for a very interesting experience. 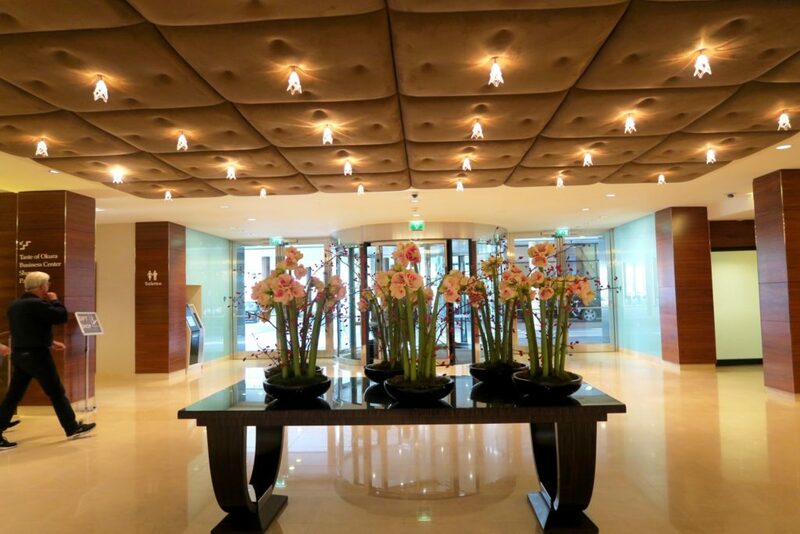 The Hotel Okura Amsterdam also has 19 conference rooms within its building. This is the only hotel in Amsterdam that has this kind of capacity and capability to house conferences with a dedicated entrance. 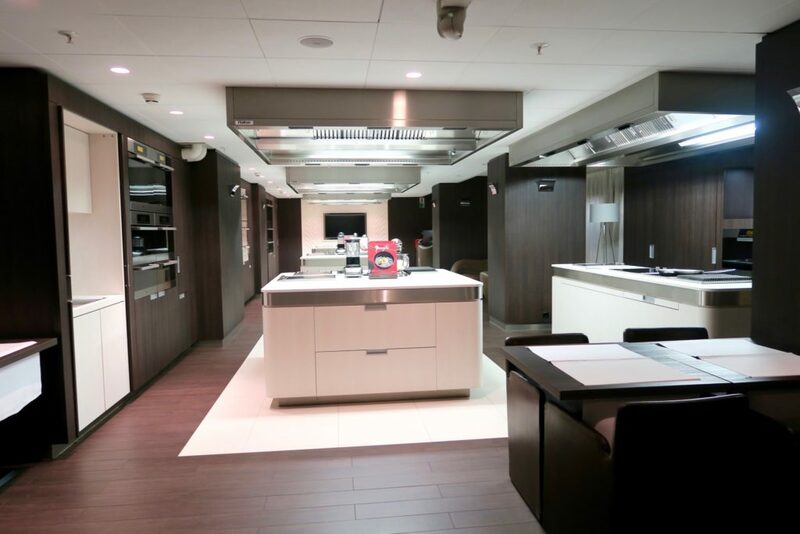 As the hotel is popular for conferences and shows, they have a dedicated kitchen (industrial sized) to cater for these events. The story behind Hotel Okura Amsterdam’s location is quite relevant to me. The initial dream of having the hotel built because it’s going to be close to the opera house has shattered into smithereens. And I admire the Okura brand for pushing through the construction of the building. And instead of bemoaning the loss of the ‘attraction’ that is the opera house, they created the attraction so that there is more than enough reason for people to come to Okura Amsterdam. With the number of restaurants and other amenities it has, the hotel is like an entire village/ complex in itself. We stayed as guests of Hotel Okura Amsterdam for the purpose of a review, but all views and opinions are mine. Thanks for sharing this one. It’s been a while since I’ve been to Amsterdam and the last few times I was staying with friends, so good to know about some lovely hotel options. 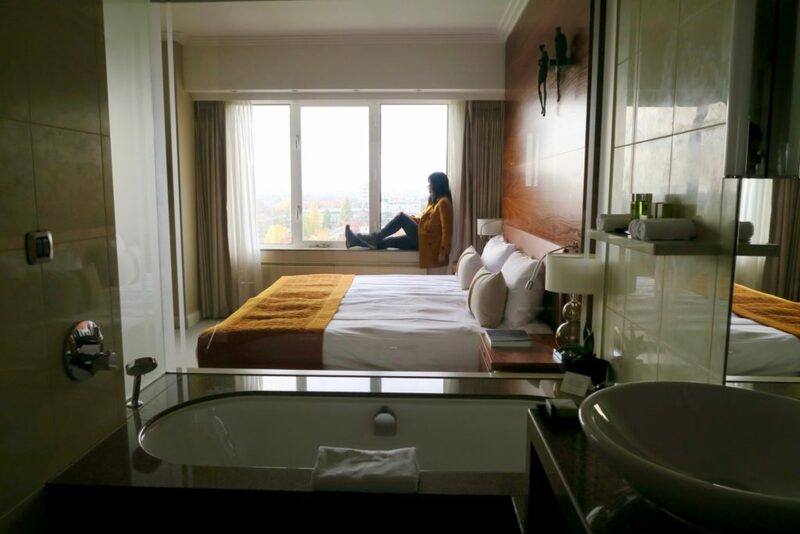 We stayed at the Okura Garden Shanghai. It was wonderful! I wouldn’t hesitate to stay with their brand. Thanks for your review. Oh it looks just wonderful Jean. Very impressive that they have amassed two Mich starred restaurants under their umbrella as well and those views! I love the philosophy with how they pushed through with their plans to make it so spectacular. I would definitely be keen to look this place up if I was visiting Amsterdam! Hi Shikha! Yes, wonderful views definitely (esp if you’re located 10th floor and above). They have 3 Michelin-starred restaurants (one with 2 stars, two with 1 star) and it really is like a plaza of restaurants in there, so busy during weekends!